You know when you’re at a networking event and you have to queue to get a coffee and you think you should say something to the person next to you but you don’t know what? Or you’re picking up a vendor from reception and you’ve got 3 minutes to fill before you reach the meeting room where the proper talk can begin? Those moments always used to catch me out too. How do you break the ice without it sounding forced or fake? 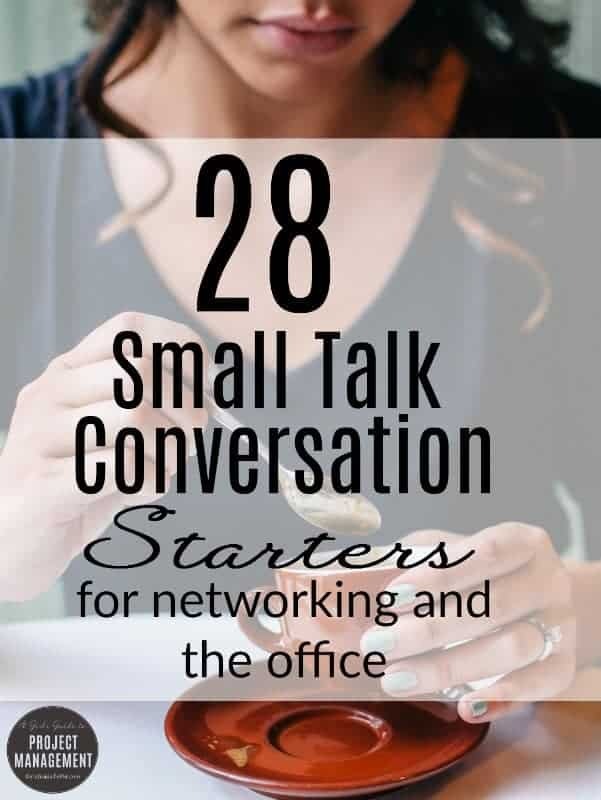 I’ve put together 28 small talk conversation starters to get you through those difficult pauses. They are mainly angled around chatting to new people at events or big meetings, but you can adapt them to use with new faces at work too (especially number 12, which is my go-to phrase for being in the lift with someone I have just collected from reception, followed by ‘So you found the building OK?’). You obviously can’t whip out the list and read from it, but memorise a few that seem to sit best with you and keep them in mind. The great thing about these phrases is that the people you use them with change all the time. It’s not going to matter if you ask 20 people the same question as they are hardly likely to meet up and compare your conversational abilities! So while you can get away with just the one, it’s worth having a few stashed away to make it more interesting for you and also so you can flex with the situation. Great ice-breaker questions, Elizabeth. Thank you! I always struggle when the person I am talking to just doesn’t seem receptive to my questions and appears to prefer the uncomfortable silence. Have you ever encountered these situations? How have you dealt with it? Thank you also for your great website and other template freebies! I do some coaching and one technique with skilful questioning is to aim for questions starting either How or What. These are much more likely to generate conversation. I note that most of your questions are How or What questions. Very usefull.Thank you for sharing.